• President Roosevelt restricts Japanese planes bomb and sink U.S.
• U.S. weapon trade with Japan. • Gunboat Panary in Chinese waters. • Nazi demonstrations taking place in Austria are supported by Hitler. 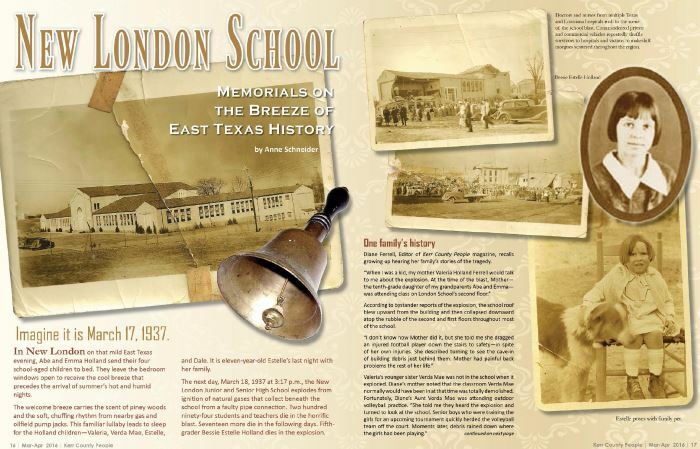 • 294 people are killed when an explosion destroys a building in New London Texas. • The German airship Hindenburg is destroyed by fire in New Jersey. • Technetium, the first manmade element is developed. Within the Articles Section of this website there are many typos and misspellings contained within the original articles. These Articles are unedited to retain originality. On rare occasions we have been refused permission to reprint an article from a newspaper. We regret the inconvenience to our visitors of this website, but respect the wishes of the publisher(s). Boomtown prosperity set the stage for the London school disaster. The legendary Texas oil wildcatter, Dad Joinier, brought in a discovery well on Daisy Bradford's farm in Rusk County in 1930. By 1936, the county's population ballooned from a few hundred to a few thousand. Companies punched holes everywhere. The oil flowed. It didn't have to be pumped from the ground. The London School campus was a new showplace in 1937, the product of new oil wealth that could not have been imagined 10 years earlier. A gymnasium, an auditorium and 10 other school buildings, interspersed with playing fields, sat surrounded by derricks, pipelines and temporary camps for the oilfield workers. The brick high school building, capped with red tile roof, was the centerpiece. It housed 650 to 700 children in grades 5 through 11. There was no grade 12 back then. At the time, the London School district was said to be the richest in the United States. A commercial utility company had been supplying natural gas to heat the school at a cost of $3000.00 a year. To save money, school officials made a change. They tapped into an oilfield gas line to get free gas, which was a natural by-product of the oil spurting from a well. It was a common practice back then to do it that way. Homeowners and businesses simply hooked to a oil well gas line for free gas, the oil companies didn't care. They had no use for the gas, and they usually just flared off into the air. After the explosion, one state inspector wrote that school officials had meant well. "There was no niggardly thought of saving, but a thrify thought of not spending uselessly," H. Oram Smith of the Texas Inspection Bureau wrote in his report. Mr. Smith concluded that the oil field gas was more unstable than commercial gas. The pressure was hard to regulate. Teachers and students had tampered with the burners to adjust them and had jostled pipes connected to the radiators. In turn, he said this caused stress leaks in the pipe couplings below the floor. "No one individual was personally responsible," he wrote. "It was the collective fault of average individuals, ignorant or indifferent to the precautionary measures, where they cannot, in their lack of knowledge, visualize a danger or a hazard." The explosion killed an estimated 280+ students, 15 teachers, 2 visitors and a school secretary. Researchers are still attempting to document the exact number. Some the death toll was higher. The explosion ranks as the third-worst disaster of the 20th century in Texas. The Galveston hurricane of 1900 killed 6,000 to 8,000. A chemical explosion in Texas City, in 1947, took more than 600 lives.